I have a few favorite baby items, and this is definitely one of them!? It is officially called the Bumper Jumper, but is is otherwise known as the “Johnny Jump-up”. I have used this for 2 of my children and am now just starting to use it with my newest addition.? I have an older model, but it is still very similar to the new one. Easily attaches to doorway – It can hook to almost any doorway that has trim molding.? 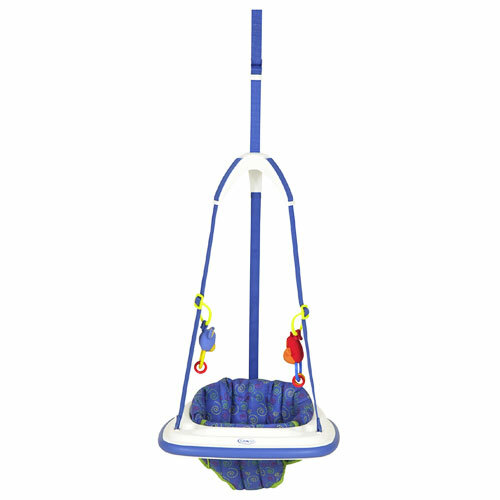 It has spring loaded clamps that attach very easily and will not move when the child is jumping.? The clamps are also designed to not mar or scratch door frame wood or walls. Toy Rings – It comes with 2 removable play toys that attach to adjustable rings.? You can even change the toys and add your own. Dome Design – This helps you to get the baby in and out without getting caught in the straps. Adjustable Height – This is great, because as your baby grows you can shorten the straps so they have more room for their legs in order to jump. Bumpers – On the outside of the jumper there is a rubber bumper around the entire thing.? My kids have gotten pretty crazy when jumping in it.? The bumpers protects them from getting hurt as well as damaging the doorway and walls if they were to bump into them. I highly recommend this product to you moms!? My children have spent countless hours jumping away and have often times, after wearing themselves out, fallen asleep in it too! It gives them the opportunity to get out all that pent up energy, especially during the winter months when we are all stuck inside.? And it helps me to get things done around the house without having to be concerned about them getting into something they aren’t supposed to. Very cute! I have a jumparoo and love it, but haven’t thought of one like this! What a cutie. It looks like they’d have a lot of fun in it. My MIL always says that my husband loved his Johnny Jump Up…but we didn’t end up with one for Tristan. Maybe, for the next. Great review. Graco Reviews´s last blog post ..Discover The Best Graco Stroller Reviews! I’m definitely getting one of these when my second child is born. They are well made products that develop a child’s movement skills at a very young age!